It is a rare sight these days to see a level crossing being reinstated from scratch and when it happens on one of England's favourite tourist steam railways, it is bound to attract a huge amount of attention. The bomac-style level crossing system manufactured by Polysafe Limited was selected and subsequently proved its flexibility and all-round capabilities, becoming an integral part of the exciting project to re-connect North Norfolk Railway to the National Rail network after more than 40 years. The project needed a fully approved system that could safely take a full range of traffic across the new rail line, which ranged from a pedestrian crossing area through to a main road crossing carrying the town's main bus route and delivery lorries. 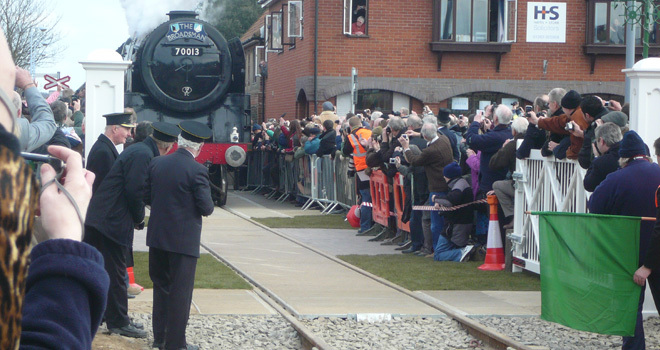 All this had to be achieved within the tight budget that North Norfolk Railway had worked so hard to raise funds for. When it came to choosing the crossing, the Polysafe system had several distinct advantages. The durable, accurate construction naturally associated with Polysafe's bomac-style system meant trouble-free installation and a low maintenance regime. This is vital for Network Rail on the mainline where track downtime needs to be kept to a minimum. It was equally vital for NNR with ongoing maintenance (as well as the initial installation) being largely completed by a dedicated group of volunteers. It was felt the high grip surfaces of Polysafe panels (even in the wet), combined with their ability to retain road markings, were key advantages. However, NNR also required a system with a high degree of flexibility as the design changed, they needed to know that the system could cope with it. For example, the sleepers were going to be concrete, but the exact type was not initially known. The Polysafe system is a bridge design, and does not rely on the sleepers (or indeed ballast) for support. It is not therefore critical to know the exact sleeper type before the system can be specified. This gave the system a distinct advantage over other systems. As the project was subject to a massive fundraising requirement, every penny had to be spent wisely. Although the Polysafe system was the preferred option due to its capabilities as a level crossing, costs needed to be justified and cost comparisons were completed. Again Polysafe scored strongly against other systems, and their policy of giving the whole cost rather than quoting some of the main components only to be added to later, helped effective budgeting. Finally, the pedestrian access section needed to be completed at an early stage, to keep a pedestrian link between the town's main car park and the shops the key point here was that this needed to be completed before plant was on site, and ideally therefore needed to be completed manually. Polysafe's new Pedestrian System was ideal. With each component weighing less than 60kg, this could easily be constructed by hand. This heavily-used example clearly demonstrates the effectiveness and reliability of this system the high-grip topping is expected to be in particular demand for pedestrian-safe crossing in depots, to signal boxes and on walking routes. Digging up the town's High Street inevitably meant that the crossing impacted heavily on the community and a strict timetable needed to be adhered to, in order to satisfy the demands of the authorities and the public. The company selected for the contract would therefore have to be able to display impeccable credentials with regard to product quality and safety credentials which Polysafe has. When it comes to level crossing systems, the minimum requirement is being fully approved by Network Rail to Line Specification RT/CE/S/040 (Polysafe are approved under Certificate Number PA05/041). However Polysafe exceed the minimum requirements by also holding IS09001 accreditation giving confidence to customers that their products are of a high and consistent quality. The company is also Link-Up approved. North Norfolk Railway needed a company that would not let them down on logistics, and would be able to react to design or timetable changes at short notice. As already mentioned, the flexibility of the Polysafe system meant that there was less risk of a problem should there be any last minute changes. Polysafe manufacture their own product in the UK, and therefore have total control over their manufacturing schedules and delivery timescales, as well as the capability to have a contact point on site at critical times. This ultimately proved to be invaluable, when severe weather conditions led to a decision by personnel at trackside to delay a delivery at less than 12 hours notice, as the delivery area could not be cleared in time. 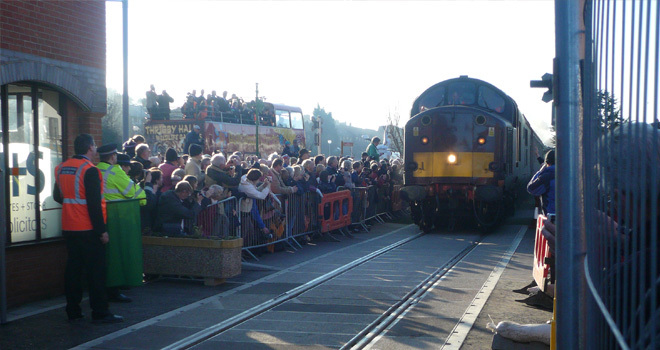 Despite the weather doing its best to delay progress, the Sheringham level crossing was opened on time by Pete Waterman with steam locomotive Oliver Cromwell, in front of thousands of guests, on-lookers and national media. Although Polysafe have been supplying level crossings for 20 years and have had hundreds of installations around the country, specialist projects such as this live long in the memory. The whole project was a huge success, proving once again that when it comes to level crossings, Polysafe are the company to deal with. For more pictures and information, please visit www.nnrailway.co.uk.